Whenever we move into a new house (as we have been known to do every two years or so since being university students), my favourite thing to do, hands down, is decorating the bookshelves. I love arranging books: stacks or vertical, and knowing where best to do both. Figuring out where to place picture frames, analyzing what those pictures say, and placing them near books of the same vein. I am a near professional when it comes to deciding where the knickknacks go: the mini Buddha, my prom tiara, the rustic alarm clock. I love the look of a full book shelf. I love even more the supremely gratifying visual effect of placing everything in the exact right place and surveying my work. I swear, if there's a job solely for book shelf organizer in an Ikea catalog or a country house furniture store, I would be all over that. I'd be amazing at that job. I would do it for pennies (and Swedish meatballs, if it was at Ikea) because I so love decorating bookshelves. Our bookshelves reflect us, better than a whole room, better than our closets, better than our kitchen. Our bookshelves illustrate what's dancing around in our collective thoughts, like a museum exhibit of our minds. The books we decided to keep, to re-read, to underline and dog-ear because we loved them so. The framed pictures, the moments we wanted to forever remember and celebrate, giving us a constant reminder of our experience as the shutter opened and closed that day. The monuments to our life that were with us at pivotal, changing moments, now sitting atop shelves as talismans to our own anthropology. 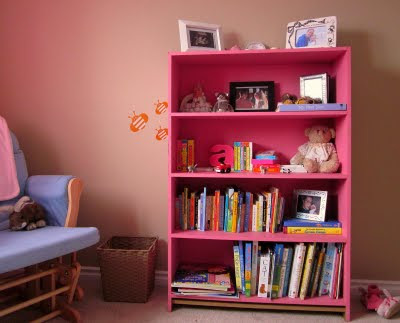 I knew Abby needed a bigger bookshelf than the one she started with in her nursery. It was over-flowing with her books when we moved to Whitehorse, and since then I have had to put away precious keepsakes and disperse her her book collection around the house. Friends of ours are moving soon, and their girls are growing up, so they offered to bring over their solid wood bookshelves, painted orange and pink. It was exactly what I had envisioned for Abby, and without the headache of having to purchase them new. Thank goodness for generous friends and serendipity. Today they arrived and I got to work greasing up my elbows and flexing my girl power to get them upstairs. I've put the orange one in the kids' guest room, saving it for the next one, whenever he or she decides it's high time to join us. I set to work moving Abby's books and trinkets onto her shelf, being mindful of what she can and cannot reach. She couldn't have cared less about the new furniture and redecorating efforts going on this morning, so she ran around the house with her broken, garage sale school bus toy(with some other kids' stickers all over it, but she loves it! ), and playing songs on her piano. (One involved a virtuoso performance of her scaling the keys while repeating the refrain "poo poo poo"). I loved amassing her treasures and storybooks. I was happy to take things out of her closet that previously had no home and displaying them, celebrating who she is and where she comes from. Oh, it looks perfect! I wish I had you here to reorganize/decorate MY bookshelf! I have one of those 5x5 Ikea ones, and it's just a jumbled mess. I'm no good at that stuff!